With voting under way and a hung parliament looking ever more likely, leading Conservatives are questioning whether the Labour Party would have the legitimacy to govern if it fails to grasp a majority. According to Britain’s constitutional laws, there is no specific rule that says the government must be led by the party with the highest number of seats. While a party with a majority is in a position to form a government, if no party wins a majority the government is created by whoever “is best able to command the confidence of the House of Commons,” according to the Cabinet Manual, which was drawn up in 2010 following a hung parliament. Although the United Kingdom's constitution is not codified in a single document, it consists of a broad body of law. A consensus has emerged among Britain’s constitutional experts that the next government need not be led by Britain’s biggest party. History teaches us that in certain circumstances the second largest party may enter government, as was the case when Labour entered power in 1924. Equally, such a scenario frequently occurs across the EU if a hung parliament arises. Irrespective of this fact, Miliband may face resistance on Friday if he seeks to form a government amid a gridlocked parliament. Critics say the Labour leader may be burdened with considerable opposition from an electorate that thinks it is wrong that a party with fewer seats than its main rival could enter government. Current opinion polls indicate the population are somewhat confounded by the prospect of a hung parliament. A recent YouGov survey found 48 percent of those polled think the leader of the party with the most MPs would have a “better claim” to become PM in the event of a hung parliament. Only 26 percent of those questioned said the leader of the party that could command a majority would have the best claim to power, despite this being the most accurate response. Irrespective of the political uncertainty surrounding Thursday’s results, the Cabinet Manual’s constitutional regulations are clear. The key issue on May 7 is not which party holds the most seats, but rather which party commands the most support in the House of Commons. The new parliament is set to meet on May 18, with official government business kicking off on May 27. On this day, Britons will hear the Queen’s Speech - the UK's program for incoming governments. The Queen’s Speech must be approved by a majority of MPs in the House of Common to ensure the incoming government has the power to govern. Analysts suggest this “alternative” would most likely be a minority Labour government. 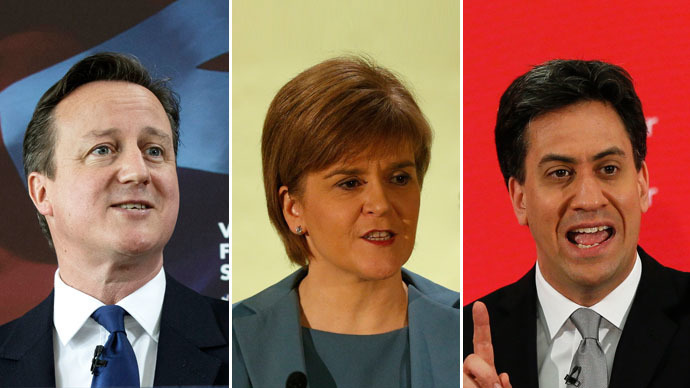 In such a scenario, Cameron may strive to prove to the electorate that Labour requires the support of the SNP to rule. Lord Salisbury adopted this very strategy in 1892 to prove to voters the Liberals were reliant on the aid of Irish nationalists to govern the nation. But such isolationist politics risks marginalizing MPs from the “Celtic fringe” and in the process stoking the separatist ideals that Unionists oppose. It was this very wording that was employed in 1924 by Labour when a gridlocked parliament occurred. If the government was defeated on this amendment, it would be forced to resign and Miliband would be asked to form a new government. The texture and tone of the incoming government would be down to Miliband, who would seek to negotiate with other parties or a single party on a formal coalition or supply-and-confidence deal. Under the latter, smaller parties would support the coalition government’s basic program, but reserve the right to oppose it on a case-by-case basis. Should Miliband form a minority government, he may seek a majority from the electorate. However, Britain’s Fixed Term Parliaments Act (2011) prevents the early dissolution of a minority government unless it proves impossible or two-thirds of MPs back it in the wake of a no-confidence vote. Were a Labour-led government to be defeated in a no-confidence vote, analysts suggest it’s highly unlikely a new government could be formed, since the Tories would already have stepped down or been defeated in the Queen’s Speech. In this scenario, a dissolution would likely follow and the electorate would face another general election.